The OEM wants to clear stock of two of its more popular smartphones to make room for upcoming releases before the start of the Holiday season. While the $180 Honor 7X isn't much of a deal, the $430 View10 makes for a nice pick given its high-end specs. Tomorrow will be a national Holiday across the United States and, naturally, many retailers will be running sales to boost foot traffic and attract buyers. Honor will have be temporarily slashing prices off its budget Honor 7X and high-end View 10 smartphones from Aug 31 through Sept 5 and Sept 3 through Sept 30, respectively. The 7X gets a small 10 percent cut from its $200 USD MSRP while the View10 will receive a larger $70 USD cut from its $500 USD MSRP across online retailers like Amazon, Newegg, and B&H. The Honor 7X launched last year for a very aggressive price of $200 USD and it was praised for offering a long list of features considering its affordable MSRP. Meanwhile, the View10 launched earlier this year as a higher-end variant of the 7X with better cameras, a brighter and higher resolution display, and a faster Kirin 970 SoC. 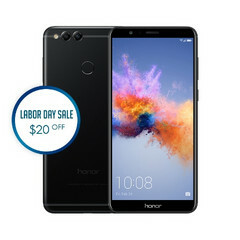 Users interested in the aforementioned smartphones should note that Honor will soon be releasing updated models and so it's arguable that the OEM is simply clearing stock of its older devices. The Honor 8X is expected to be unveiled in a matter of days and hints of the Huawei Mate 20 have been spotted online. The Honor Play will also be coming soon to Europe with many of the same features as the View10 but for a lower starting price of 350 Euros.